Eggplant is an annual vegetable in the Solanaceae, or nightshade, family, which includes tomatoes, potatoes, and peppers. It is easy to grow in the summer garden as long as the proper conditions are provided. 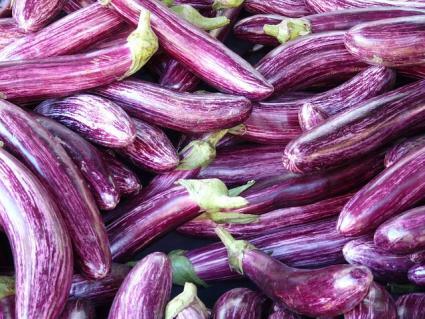 With its smooth purple skin and quirky oblong shape, eggplant is one of the most interesting looking vegetables. It also has large purple flowers and felty, grey-green leaves that make it one of the most beautiful plants in the garden. The plants grow to about 24 inches tall and wide. Eggplant can be grown during summer in most zones though it does best in warmer climates. The plants need a long hot growing season to produce well, which usually restricts them to being grown in USDA zones 4 and warmer. 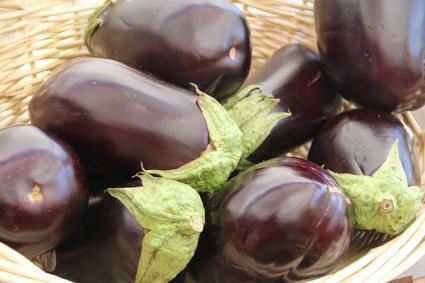 Eggplant needs at least 8 hours of direct sun each day and a bed of rich well-drained soil. Raised garden beds that have been enriched with compost are ideal. 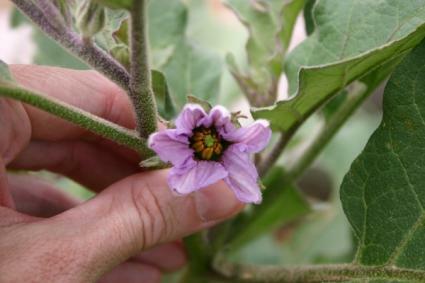 Eggplants may be started by seed indoors 4 to 6 weeks before the average date of last frost. Plant them in a sunny window or greenhouse where nighttime temperatures will stay above 60 degrees. The seedlings should emerge in 10 to 20 days. Transplant your homegrown or store bought seedlings at least a week or two after the average date of last frost. They grow lethargically until the soil has warmed up to at least 50 degrees which is always later than the average date of last frost. Plant the seedlings 24 to 30 inches apart. Eggplants need attention throughout the growing season to produce a tasty and abundant crop. Water eggplant whenever the top inch of soil dries out. Remove weeds that threaten to crowd the plants on a regular basis. Fertilize every two weeks with a balanced fertilizer for maximum yield. Pinch out the top few inches of growth when plants are about 12 inches tall to encourage low, bushy growth. For the biggest eggplants, remove all but 5 or 6 fruits from each plant. Stake plants if they grow to over 24 inches in height to prevent them stems from breaking under the weight of the fruit. Eggplant is not considered difficult to grow, but there are a number of pests and diseases to watch out for. Flea beetles, tomato hornworms, aphids, cutworms, and various other insects often attack eggplant, though the damage is usually minor. Insecticides may be used, but if an all-natural approach is desired, try using an insecticidal soap to repel these pests. The eggplants should start to mature about 3 months after transplanting. The fruit can be harvested at any size as long as it is fully colored and shiny. Often, the smaller fruits are more tender and tastier than those that have been left to grow larger. When picking, use scissors or hand pruners to cut off the fruit with a short piece of stem attached. Eggplants will keep for many weeks in the refrigerator, but the flavor is best if they are stored above 50 degrees. They will usually keep for a week or more at room temperature. Always store eggplant in a dark, dry place. 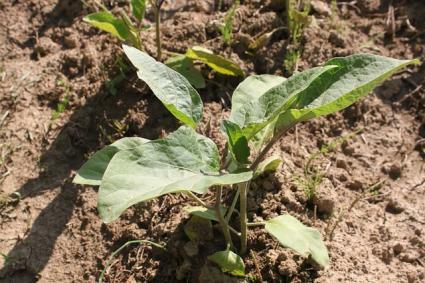 Eggplant seeds and seedlings are commonly available in garden centers during spring. Experiment with some of the varieties below. Eggplants have such good looks it almost seems like they belong in a flower bed. As long as you provide full sun, rich soil, and regular moisture, they are generally easy to grow. They can even be grown in a pot where you can enjoy them up close.